The Tailgate is back! 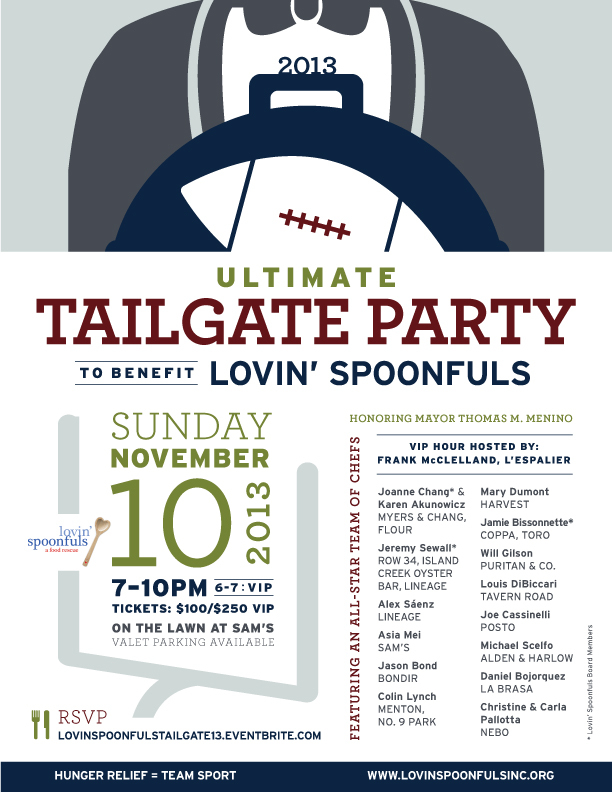 We are thrilled to announce the return of Lovin’ Spoonfuls’ Ultimate Tailgate Party, which will take place on Sunday, November 10th, 2013 on the lawn at Sam’s, overlooking the scenic Boston waterfront. This year’s Tailgate will be bigger and better than ever, featuring 17 of Boston’s MVP chefs, signature cocktails, a silent auction featuring exclusive experiences, entertainment, and much more. We are excited to welcome Mayor Thomas M. Menino as our guest of honor, to thank him for his relentless commitment to the city of Boston and his support of our organization. In just 3 ½ years we have rescued over 750,000lbs of fresh, healthy food that would otherwise be thrown away and distributed the food to local soup kitchens, homeless shelters and other crisis centers throughout the Greater Boston area. With your continued support we can continue to grow and expand our services throughout Massachusetts. Tickets and more information is available here – we hope to see you there!